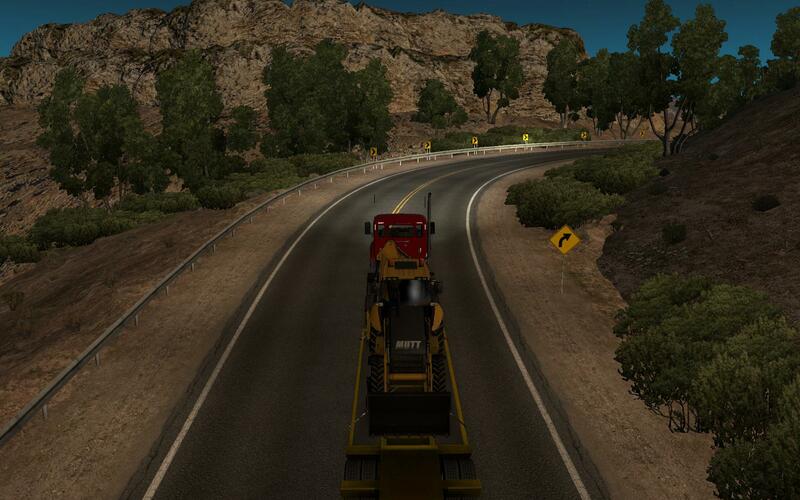 Similarities to Euro Truck Simulator 2 are a bit too obvious. 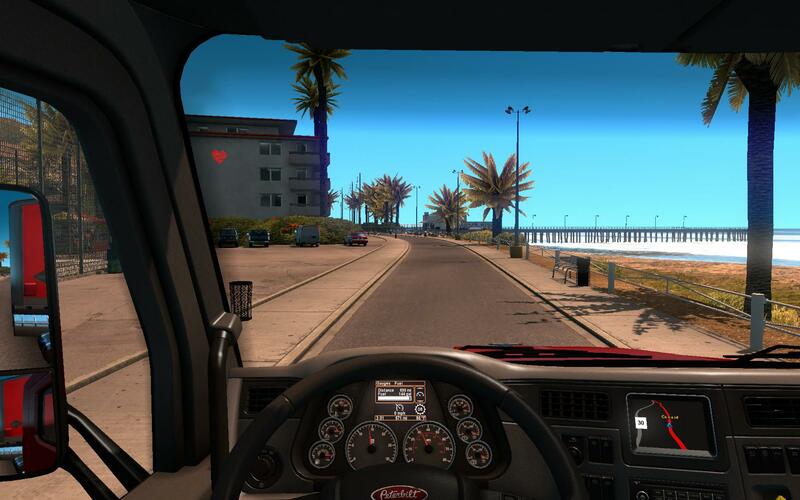 SCS Software decided that it’s high time we packed our bags, took our truck driver license together with our favorite windshield toy, and head to the other side of the ocean. After few years of driving on the Old Continent and creating an empire of transportation, the Czech studio is taking us to hot California and equally vast Nevada. The change is quite apparent, and you can actually see it, hear it and feel it. Being a truck driver in the United States is a completely different – and much better – experience. We learned about the existence of American Truck Simulator a long time ago. 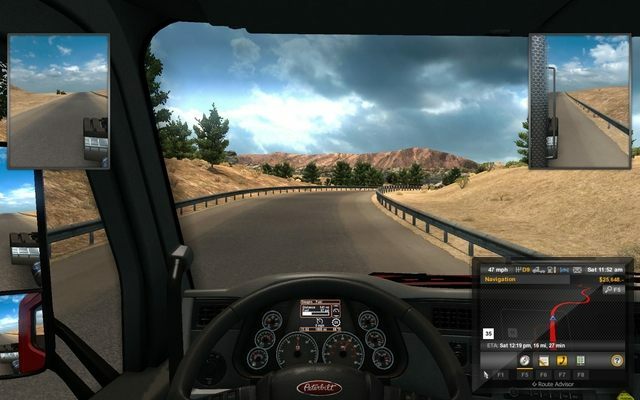 Although Euro Truck Simulator series was undoubtedly an amazing phenomenon that attracted thousands of sim lovers and fans of big trucks, many gamers wanted something new that would make them twice as excited to take the steering wheel of the 18-wheeler and roam the highways with more and more expensive cargo. A virtual trip to America is supposed to be that motivating factor and I believe that’s the best decision the developers could have made. 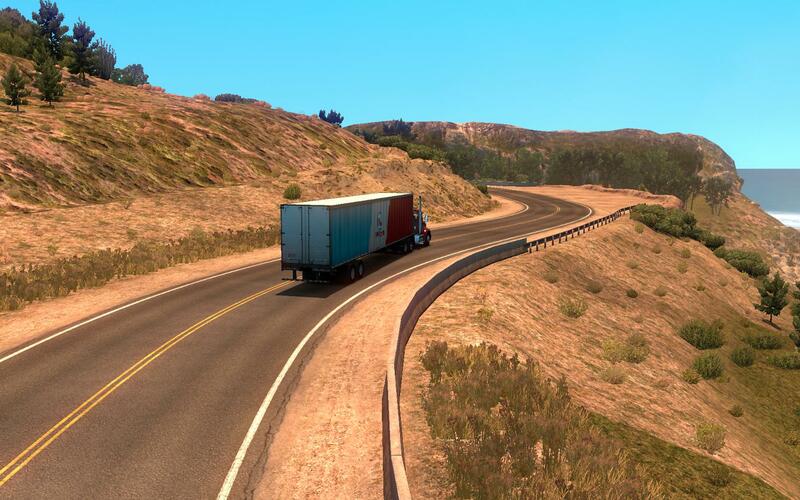 For many months we had no idea what American Truck Simulator will be like – the release was delayed a number of times, the developers repeatedly mentioned that the project is still not in the condition they want it to be. The biggest surprise for many people was that initially we will only be able to drive across two states: the abovementioned California and Nevada. However, believe me when I say that if the continuously added states will be the size of what we already got, in the end we will get a game with amazingly huge world. 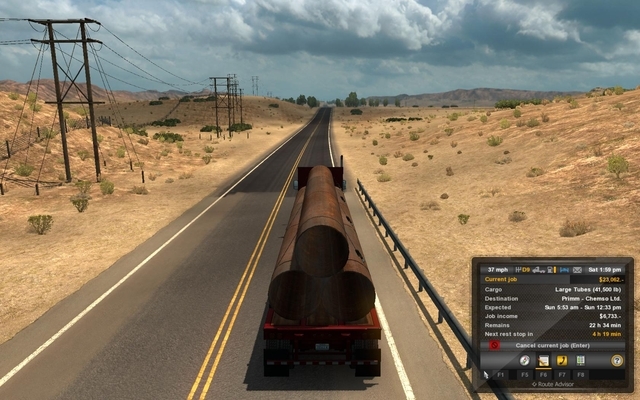 If you have ever played any games from SCS Software, you will quickly feel at home with the gameplay mechanics in American Truck Simulator. Almost nothing changed in terms of the way you play – once again you start a traditional career of a truck driver, then you buy your own truck, and finally you become the owner of a big transportation company. The developers admit that the game is strongly based on ideas we know from Euro Truck Simulator 2 and you can actually see it on many layers. 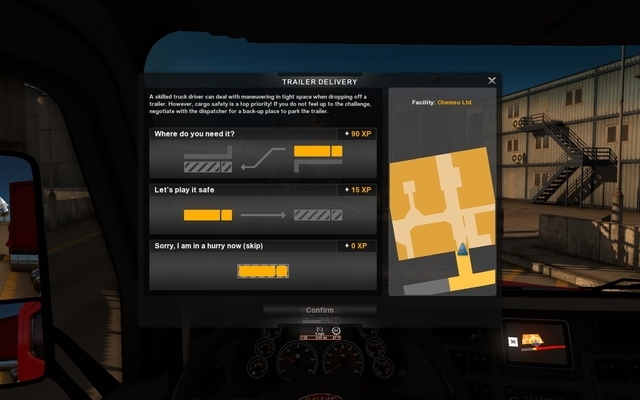 In the game we are welcomed by an almost identical main menu and a company manager; we see the familiar route advisor which is a kind of an uber-GPS, and all the technical aspects of operating the truck’s cabin or the external elements of the truck will be very familiar to all the the truck lovers out there. This doesn’t mean, however, that American Truck Simulator has no novelties up its sleeve; on the contrary, there’s a lot of new stuff in here. The American wasteland is really tempting! We now have a chance to visit over 30 cities connected with a really dense road network. Sure, some people might complain that Euro Truck Simulator 2 had almost twice that number on the release day, but these are two different things in terms of architecture and size of the area. Individual locations are much bigger than their “European cousins” and driving from one end to another will now take more than just two minutes. Moreover, you can see some objects characteristic for certain locations – when we drive into Las Vegas, we will immediately see lots of casinos, whereas Los Angeles will welcome us with tall skyscrapers that will soon be replaced with palm trees, luxury villas and holiday attractions. Somewhere in there are local transport companies and potential clients that will gladly hire us. That’s how a real truck driver roams the roads of America. However, before we get to these cities, we will enjoy driving a really complex and amazingly thought-out network of roads. There are highways with multiple lanes that are so characteristic to the United States, and we also get a chance to drive really wide but super-packed-with-traffic streets of California and Nevada. However, driving between cities isn’t always that pleasant – we regularly encounter places with cracked and much-less-comfortable roads; many times we will be forced to slowly drive up the slope of a two-lane road where 20-30 miles is the maximum we can do. The variety in the roads we drive is a great representation of what the United States is all about in terms of driving – it’s not always a perfect place to travel. 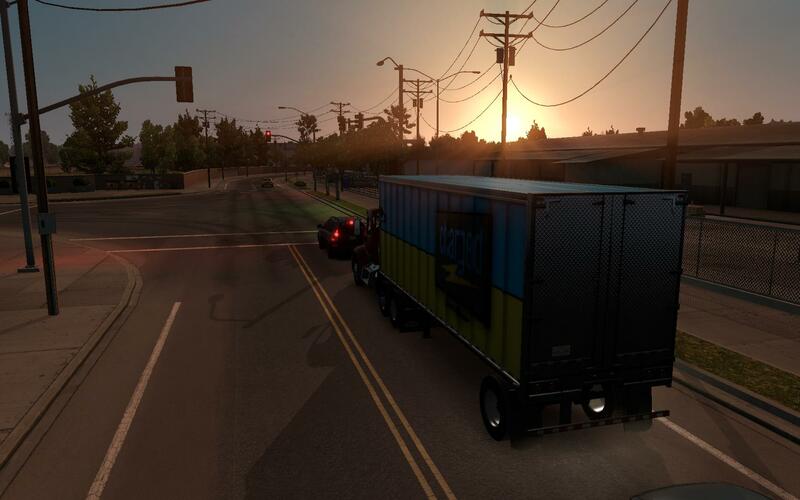 With a sunrise like this, no driver will fall asleep! I must admit that the Czech studio presented the atmosphere of the United States brilliantly, especially when we think how different it is from what we can experience in ETS 2. Cities and roads that add up to that “US feeling” are complemented by lots of small things. What makes a huge impression is the diversity in landscapes that we pass when completing our errands. One moment we try to make our way through a crowded highway, and then we drive all by ourselves through a dry land burnt by the sun. We can’t complain about the lack of buildings that we always relate with the American wasteland – we will regularly stop in characteristic motels and gas stations; moreover, we won’t be able to access some roads without stopping by the weighing station. Phew, good thing there are side barriers on the road! Is that Croatia? No, wait…. Keeping in mind that various states have different traffic laws, we can expect differences in speed limits: California allows for the top speed of 55 MPH, whereas you can drive up to 80 MPH in Nevada. The limitations change regularly and sometimes it is quite surprising, and that’s why you need to be mindful of the police that for the first time not only gives tickets, but they also roam the roads and look for any signs of potential violations of traffic regulations; sometimes they even set up patrols by the side of the road. I definitely won’t recommend speeding over the limit, because the characteristic black-and-white patrol cars can show up when you least expect them, and the ticket you get can really make your wallet cry, especially in the first stages of the game. $900 for speeding? $700 for crossing on the red light? $1800 for a small fender-bender? When you consider how (not-)much money you get from a single errand, it may take a lot of time before you get your own truck, especially if you tend to get tickets every now and then. Someone has to move the heavy stuff as well, right? Many times – either while testing new fixes to ETS 2 or playing the expansions – I complained on the fact that other drivers behaved as if they never took any driving lessons. With pleasure I admit that driving as a part of the traffic is now on a completely different level – cars not only drive according to the regulations, but the AI-controlled drivers are often careful with their trust when our driving is far from being in accordance with the traffic regulations. The way the traffic behaves on busy intersections within crowded city centers is much better as well – virtual drivers don’t violate the right of way and they let other cars pass; lanes dedicated to turning are the biggest upside, because they definitely decrease the number of cars waiting on the intersection. It’s definitely worth highlighting that real drivers could learn a lot about the “zipper method” from these AI-controlled cars. This is the new cargo delivery system on site. 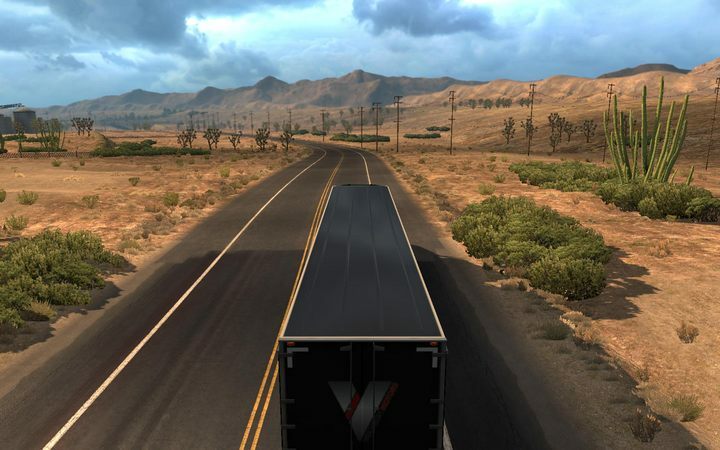 Many players will be definitely disappointed by the fact that there isn’t many trucks to choose from in the beginning – the creators only made it possible to purchase two trucks: Kenworth T 680 and Peterbilt 579. We can only hope that more vehicles will be featured in the game soon (the developers hope that a commercial success of their game will help them with negotiating licenses acquisition), but the ones that are already present in the game look really good and they really resemble their real-life counterparts. These trucks are real road cruisers that can obviously be upgraded (also in terms of visuals). The driving model hasn’t changed much since ETS 2, but it’s worth pointing that it is a little bit more difficult because of the longer trailers that we now use. A very good new idea is the way you can leave the cargo at your destination; up until now it was possible to park in a traditional way in order to get more experience points, or automate the process while slowing down your leveling speed at the same time. Now you can leave the trailer nearby by doing a simple maneuver and getting a small (but often very useful) number of experience points. It’s a great feature for casual players who can improve their driving technique thanks to this solution. The two states – California and Nevada (the latter of which you will get on release day for free, no matter whether you buy a box or digital version of the game) – will soon be joined by the third one. Arizona will be added with no additional charges to all the owners of the game. The following areas are to be released in regular time intervals and it will depend on how well the game will sell. Better results will make it possible for SCS Software to increase their workforce, so it’s up to you, sim fans – get to work! 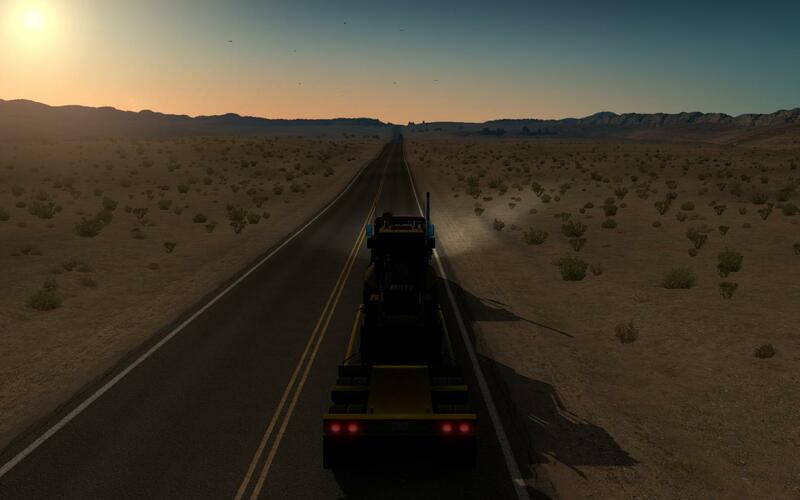 On the technical side, ATS is taking a huge step forward when compared to the Euro Truck Simulator series – the dynamically changing landscapes can often amaze, especially during the colorful sunrises and sunsets. I really appreciate the cities that are architecturally more complex, and the increased traffic is what this game really needed. This may not be a game that offers the map of similar size to ETS 2 in its current shape, but richness in forms of terrain and additional road-side attractions make it hard to actually notice it. At the same time, the game runs really smooth – there are some occasional problems with animations, but there are never any loading screens while we drive. Those who keep saying that truck simulators work best as insomnia meds should finally stop repeating these stereotypical phrases and simply play American Truck Simulator. It’s only the beginning of a long journey on the virtual roads of the United States – and it was worth the wait. ATS is a great evolution of things we know from the previous games of the Czech developer and it perfectly introduces lots of interesting gameplay ideas; above all, the game creates an amazing feeling of the trucker America – vast, full of complex road networks, and with some unusual traffic regulations that you either accept or hate. This is definitely the best simulator out there that will take hundreds of hours out of our lives and it will make the army of modders rush to their computers to create some new elements of the landscape, new trailers or additional areas. This is where the great strength of the series lies, and we can definitely expect it to increase even more. Hats off, gentlemen – and I’m going back to the cabin. After all, the TVs won’t get to Oxnard by themselves. I’ll see you on the American roads!